Preheat oven to 325’F. (165’C.). Generously grease a 5-cup fluted or plain tube pan and dust lightly with flour. Sift flour, baking powder and Mixed Spice into a bowl. Add margarine, superfine sugar and eggs. Blend cocoa powder with hot water and add to flour mixture. Beat well with a wooden spoon 2 minutes or 1 minute if using an electric mixer. Turn mixture into prepared pan. Bake in preheated oven 1-1/4 hours or until well risen and cake begins to shrink from edges of pan. Carefully turn out cake onto a wire rack and cool. Combine granulated sugar and 2/3 cup water in a saucepan. Add cinnamon and heat gently, stirring to dissolve sugar. Boil 5 minutes. Remove from heat, add rum and discard cinnamon. Place cake on a plate. Spoon syrup over cake and let stand 2 hours. Stud top of cake with almonds. 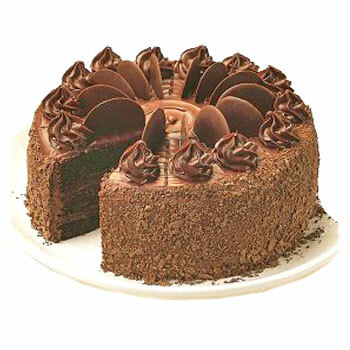 Melt chocolate; carefully spoon over cake, spreading to give a smooth even coating. Let stand several hours. Pipe (with a pastry bag) whipped cream around bottom of cake.